Only 2 butterflies left to go after this week, and I can't tell you how excited I am to put this all together!!! 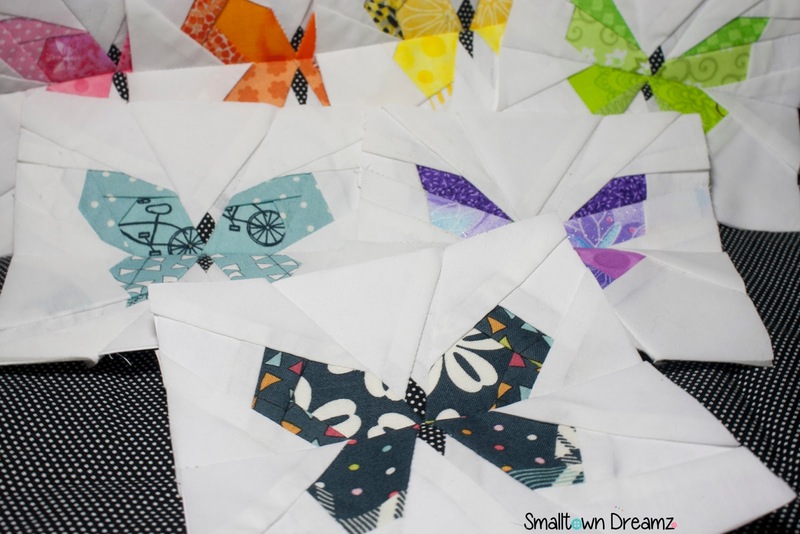 For those of you that are just tuning in My best Friend Crystal from Crystalized Designs and I have been doing a butterfly charm block sew along. We are using the Butterfly Charm Block Paper Piece Pattern by Lillyella stitchery. If you have never done paper piecing before I honestly suggest just trying it out. We have had so much fun with this and it really is so easy!! I had never done paper piecing before we did this project but I checked out a tutorial by Connecting Threads. After I watched this a few times it has been super easy ever since!!!! For this weeks Butterfly I used the Lucy's Crab Shack Charm Pack from Moda Fabrics again. I think the little touches of other colors in there help tie it together with the other butterflies, since the other ones are so much brighter.